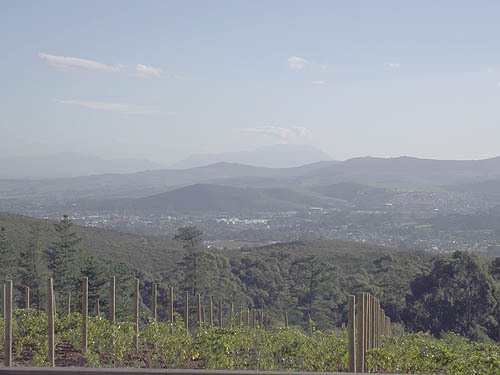 Stellenbosch is the second oldest town in South Africa and is situated in the centre of the winelands of the Western Cape. There are a number of well known roads in and around Stellenbosch but I suspect that the Helshoogte Pass is the most well known. 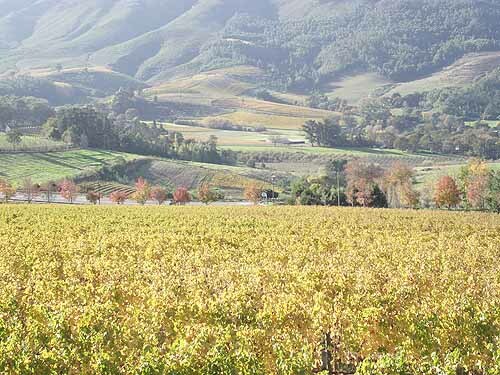 It got its name in the times of the Dutch 300 years ago when farmers had to cross the mountain range which separates Stellenbosch from Franschhoek using their ox wagons. The road is very steep and in those days was difficult to traverse with oxen dragging a heavily laden wagon.Today those old farmers would be amazed at what they see on the Helshoogte Pass. Not only is the road beautifully tarred but there are also some beautiful farms clinging to the hillside above it. At the pinnacle of the Helshoogte Pass mountain pass a brand new farm named Delaire Graff has been laid out. The previous owners of this land farmed with grapes but as the vineyards were pretty old the new owner Laurence Graff decided to replant all the vineyards with new vines in an effort to grow top quality wines. Mr Graff, chairman and founder of Graff Diamonds International has invested countless millions in this property over the past five years and has set his sights on making the farm one of South Africa’s ultra premier wineries, restaurant and hotel destinations and I think he has succeeded. 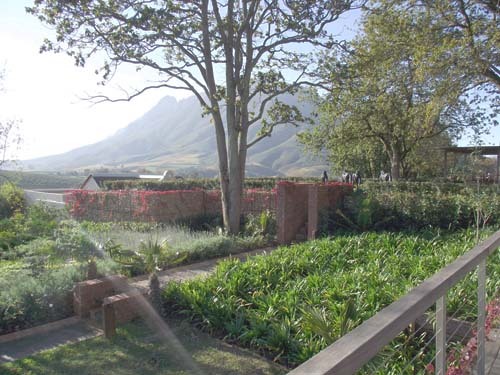 The entrance to this farm is situated nearly at the top of the Helshoogte Pass and once you pass through the security gates at the entrance a beautifully paved road takes you still higher up the mountain slopes. On both sides of this road the earth walls have been built up and landscaped with rocks from the farm. Beautiful gardens have been laid out along the road and around the buildings on the farm. To add a bit of African wildlife to the farm’s atmosphere a number of cheetah statues have been added in and around the gardens. The beautiful gardens were laid out by Keith Kirsten one of South Africa’s well known TV gardeners and he really had his work cut out to produce this garden. 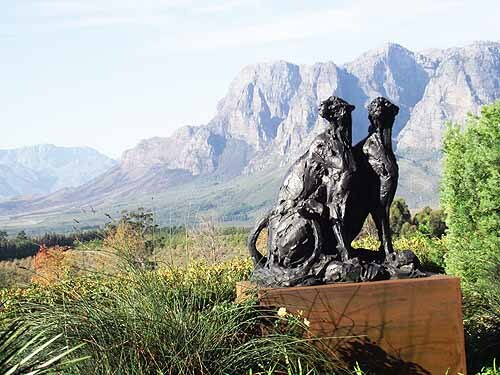 Other than the cheetah statues Mr Graff has also invested in a whole host of different artworks and sculptures which have also been placed in strategic places around the gardens and the restaurant. On arrival in the parking area at the top of the hill you are mesmerized by spectacular views of the Helshoogte valley. At present the vineyards are in the process of losing their leaves and the yellow and red colours of the dying leaves are quite spectacular as are the mountain backdrops on the far side of the valley. 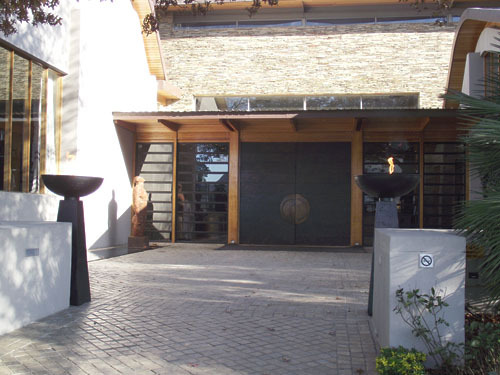 Once you leave the parking area and make your way up the stairs to the entrance to the winery, restaurant and wine tasting rooms you enter a world of rock walls, high ceilings, art and sculptures.At the entrance to the terrace at the top of the stairs are two fountains of fire. The terrace and entrance before you reach a tall door that looks like the old fashioned dungeon doors is lined with sculptures. Just inside the large entrance door the staff are waiting to welcome you. The door opens as if by magic and in front of you high up on the wall above reception is a large painting of a woman looking down on you. 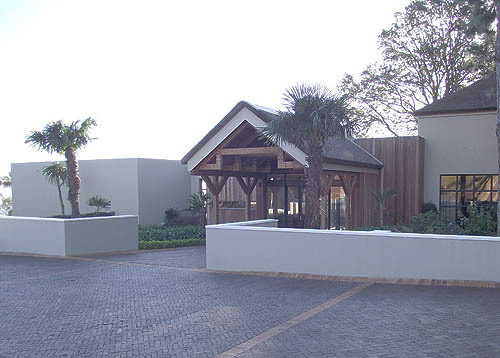 To the left is a long passageway leading to the entrance to the Delaire Graff Restaurant. 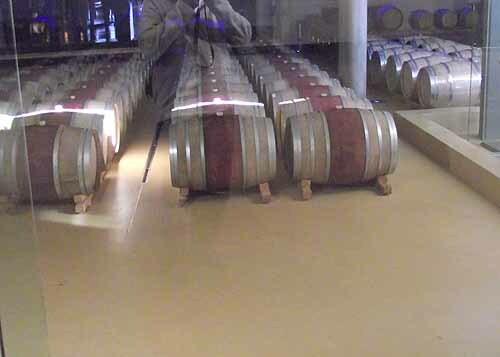 Along the edge of the passageway inside the building is an indoor river gurgling its way down towards the entrance.Windows along this passageway give you glimpses into the restaurant and also the wine cellars. 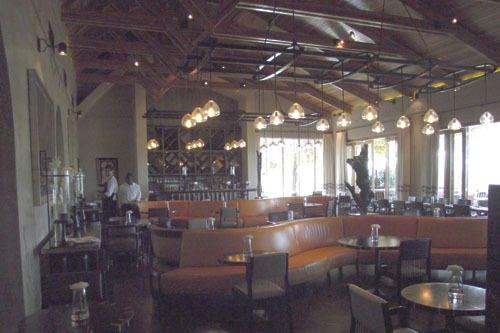 The restaurant is interestingly designed with its long orange coloured S shaped seating which divides the restaurant into small alcoves around tables where guests can be seated. 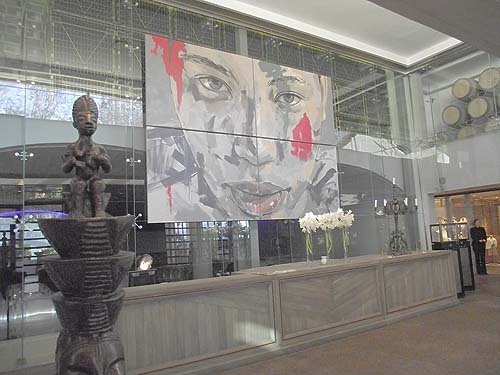 There are also a number of paintings and sculptures placed at strategic points around the restaurant. Outside is a large terrace overlooking the vineyards of the farm and the spectacular valley and mountains surrounding the valley where visitors dine on beautiful summer days. 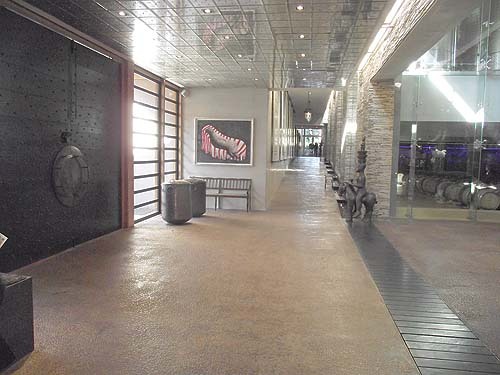 To the right of the entrance is another passageway, shorter than the first which takes you to a window where there is a large pond and where the river exits the building into the pond.The entrance to the Delaire Graff estate’s wine tasting room opens up off this passage. 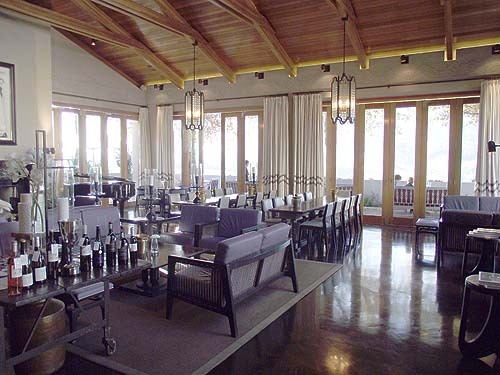 The room is dominated by a large fireplace and a counter where the estate wines are showcased to those who are interested in tasting them. In the entrance hall and reception area is a large alcove where a boutique selling designer ladies clothing has been established for the benefit of guests visiting the spa and needing something to wear. 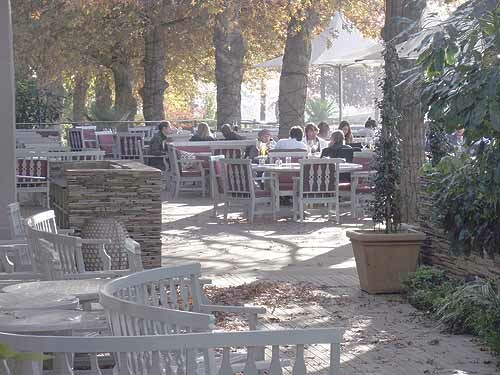 After having explored the restaurant and wine tasting room and the gardens one would think you have seen everything. This however is not the case as the spa and the boutique hotel are still waiting to be explored.The restaurant and the Delaire Graff Spa are within walking distance of each other but the estate staff will not allow you to walk. You are invited to ride in an electric golf cart which will ferry you to the entrance of the spa before you are introduced to the receptionists who are waiting to meet you. From the entrance you are escorted through the spa, gym and treatment rooms before being shown the second restaurant on the estate called the Indochine Restaurant. This restaurant although mainly for guests staying in the hotel is also open to the general public for lunches and dinners. 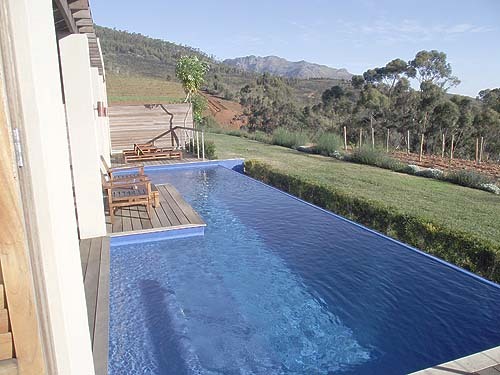 On the deck outside the spa is a large swimming pool with spectacular views of the vineyards clinging to the mountain slopes above the spa and the Stellenbosch valley below. In the distance one can also see Table Mountain. This boutique hotel is different from most other hotels in that it is made up of a number of free standing luxury and super luxury lodges. The lodges come in two sizes, either with one or two bedrooms.The owners lodge as it is known is the best and most expensive of the lodges. It has two bedrooms, a lounge, a butler’s kitchen and a stylish en suite bathroom with a walk in closet. 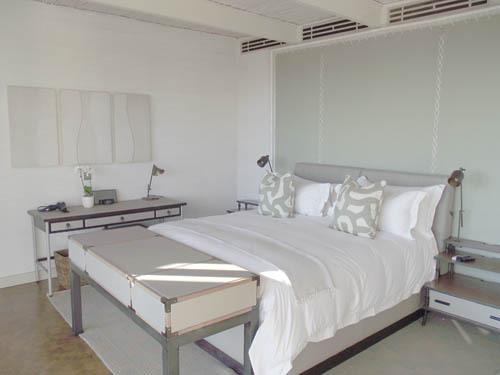 The large king size bed is positioned opposite the large glass windows and has views out over Stellenbosch. Curtains and television are controlled from the bed by means of a remote control button. All meals can be delivered to the lodge if one is too lazy to dress for the restaurant. 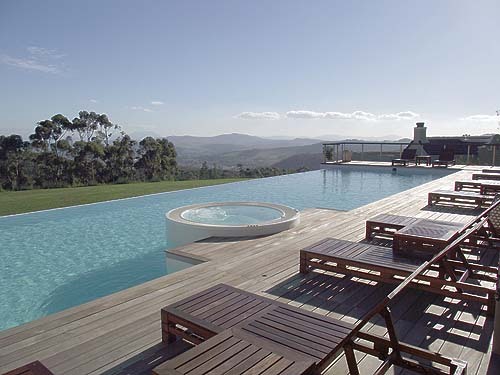 On the deck of this lodge is a heated pool set aside for exclusive use by the guests staying in the lodge. The lodges are all privately situated in a semi circle overlooking the views of the Helshoogte valley.As mentioned earlier the gardens around the lodges are spectacular and a large lawn on the level above the lodges has a number of cheetah statues on it. To spend a night in this lodge is unfortunately not the destiny of the normal man in the street. Prices are aimed at the very rich and famous with the cost of the owners lodge for one night being more than the monthly salary of a normal South African resident. The price of the lodge includes a whole lot of extras for guests spending time in the lodges. 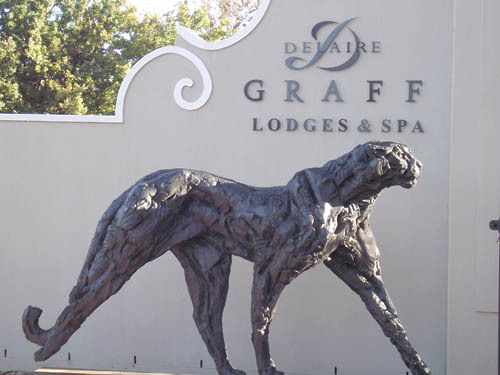 For more information visitors should visit the Delaire Graff website.